Is Glo right to be chasing Comium Cote d'Ivoire? Globacom is reported to be eyeing Comium Cote d’Ivoire as a possible acquisition target, Agence Ecofin reported last week. As with all these things, there are two sides to the balance sheet. In the deficit column Comium is reported to have debts of some XOF 60 billion (USD120.7 million). If Glo was the only interested party, then that would be a positive, but Airtel is also reportedly in talks with Nizar Dalloul, the Lebanese founder of the Comium Group, so it could still be a two-horse - or more - race. However, on the asset side in mid-2013 it was estimated to have some 1.5 million mobile subscribers representing a market share of 8 percent. At the end of 2012 it was reported to have just 270 post-paid subscribers, the remainder being pre-paid. It also has established network infrastructure, so Glo is spared the long delays associated with a new licence - something it will want to avoid given its experience in Ghana, where its network launch was much delayed. Having launched with a modern network and direct access to its submarine cable, it has still failed to dent the share of the major players. At the turn of the year Glo was blaming its resellers for its failure - a clear case of shooting the messenger if there ever was one. MTN is the largest mobile operator in Cote d'Ivoire with 36 percent of the market, closely followed by Orange with 30 percent. Mobile penetration at the end of June was 79 percent. The other potential target might have been the Libyan-owned LAP GreenN. In June its CEO Wafik Shater Khalifa was saying it had faced a difficult period due to crises in both Côte d'Ivoire and Libya. He claimed that sanctions imposed on Libya by the United Nations had increased the Group's debt as it had to pay the government for its licence, its suppliers (Huawei) and its staff. However the CEO was claiming it had cleared half of its total debt, and Libya had provided funding of some USD 20 million, which it turn has allowed it to pay the government XAF 15 billion (USD 29.7 million) for its licence. LAP's operations in Cote d'Ivoire remain relatively low-key, being ranked fifth by subscriber numbers at the end of 2012, with only the recently launched Cafe having a smaller subscriber base. This is, of course, not the first time that Glo has looked at Cote d'Ivoire as back in 2009 it was looking at Aircom. Aircom had been granted a licence in August 2000, and went on to launch in January 2012. Meanwhile, in November 2009 Globacom obtained a licence allowing it to provide international carrier services for local operators into and out of the country. Meanwhile politics is never far from the surface, and in September the Minister of Post and ICT (MPTCI), Bruno Koné was busy justifying his decision to award a 3G licence to Etisalat's Moov unit, having overridden a decision made by the industry regulator. Of the five mobile operators, only three (Orange, MTN and Moov) applied for a 3G licence. Having considered the tenders, ATCI chose Orange and MTN, claiming that Moov had not fulfilled the required conditions. Moov however is willing to pay the XOF 6 billion (USD 12.1 million) licence fee, which Koné reckons trumps whether they can actually provide a service to the desired standard. Nonetheless, should Glo proceed with an acquisition, it still leaves ranked fourth in a market with six players. This will be at a time when the perceived wisdom is that there are too many players in many markets, with three looking like the optimum number. Being fourth does not sound like a particularly clever place to buy in to, particularly if there is another market not too far away where any lessons learnt have yet to be applied. Has Tigo lost its way in Africa? 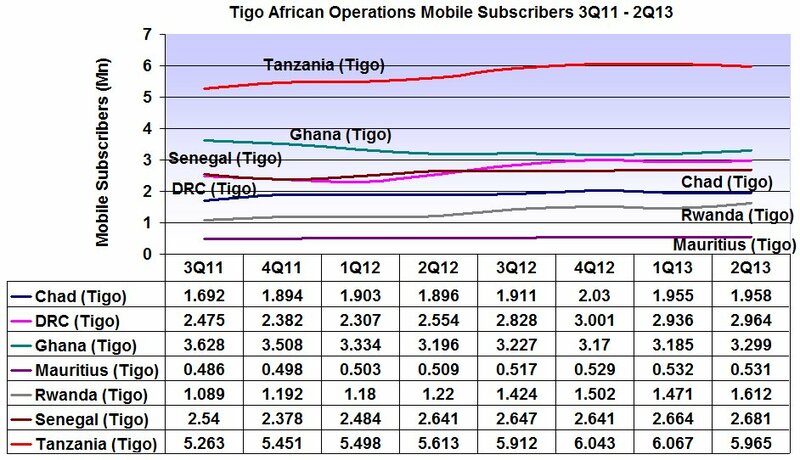 Has Tigo lost its way in Africa? 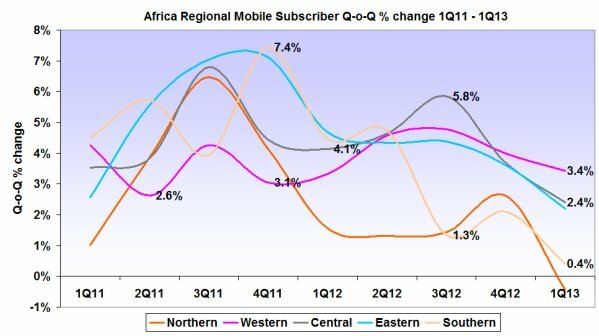 I only pose the question because in its second quarter report for 2013, its subscribers numbers by African operation appear flat or in decline (see figure 1). 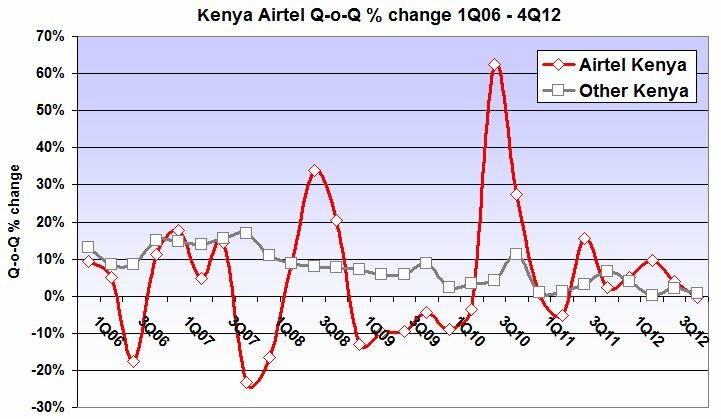 Even in Tanzania - its biggest market by some margin with 5.97 million subscribers - the subscriber base appears to max out at some 6.7 million at the turn of the year, and then falls to 5.97 million at the end of 2Q 2013. Or take Ghana. This is a highly competitive market, which last year saw the arrival of Nigeria's Glomobile. Yet despite Glo's poor early uptake, Tigo ended 2Q13 with 3.3 million subscribers, down from the 3.63 million, which it had at the end of 3Q11. In Senegal it has effectively flat lined since the end of 2Q 2012, when it had 2.64 million, and ending 2Q 2013 with 2.68 million, a gain of only 40,000 in 12 months. The Democratic Republic of the Congo again saw a flat profile in the last three quarters. 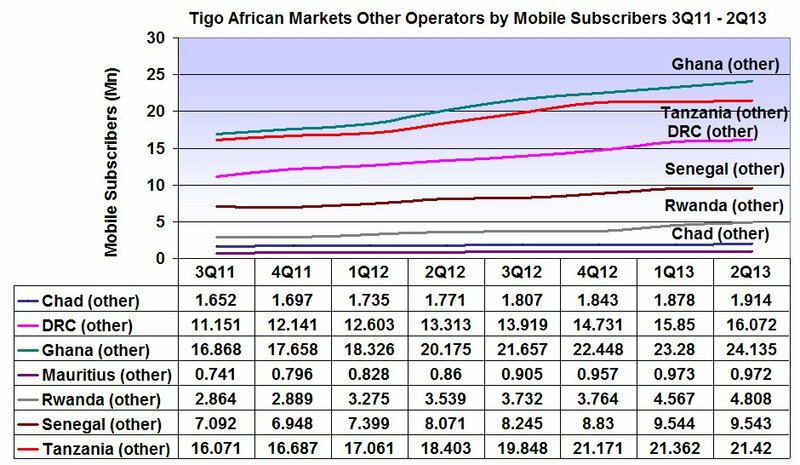 In fact, the only market in which Tigo has reported a rising subscriber base is Rwanda, which has risen from 1.22 million at the end of 2Q 2012 to 1.61 million a year later. Now it could be that these particular markets are currently experiencing low growth, and that Tigo is performing well against its competitors. But remarkably all the major markets - Ghana, Tanzania, DRC, Senegal and Rwanda - have all shown healthy growth during the period. 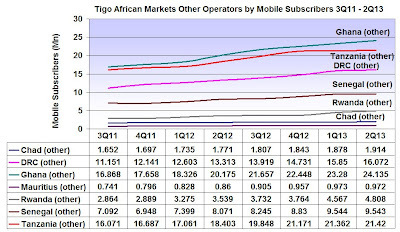 The table below shows the performance of Tigo competitor's in its African markets. 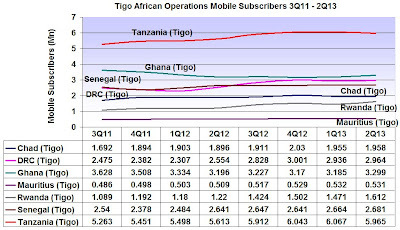 The other operators in Ghana (so now excluding Tigo's subscribers) have added some 5.3 million mobile subscribers in the eight quarters examined; Tanzania's non-Tigo subscriber base flattened recently but nonetheless has added around 5 million. The DRC's other operators has recorded just under 5 million net additions, and Senegal added 2.5 million. Even Rwanda chalked up 2 million. In its 2Q 2013 report Millicom noted that it is now reinvested in Africa, where it said 'the business needed support for its networks and brand'. Some of the problem may well be that it has other investment priorities, as in the second quarter it invested some USD 154 million in capex, including USD 15 million in spectrum, in South America. The spend will return to Africa in 2013, with the capex to revenue ratio peaking at around 20%, excluding spectrum acquisition. This, Millicom notes, will be driven by continued investments in 3G 'capacity and coverage, notably as we roll out further countries in Africa'. Welcome news indeed. 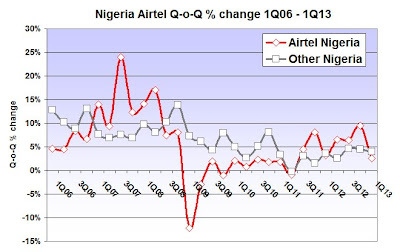 In August 2013 Bharti Airtel raised its stake in Airtel Nigeria by 13.36 percent. BusinessDayOnline quoted a note to stakeholders as saying that the stakes had been acquired from 'certain existing shareholders although the financial details not disclosed. 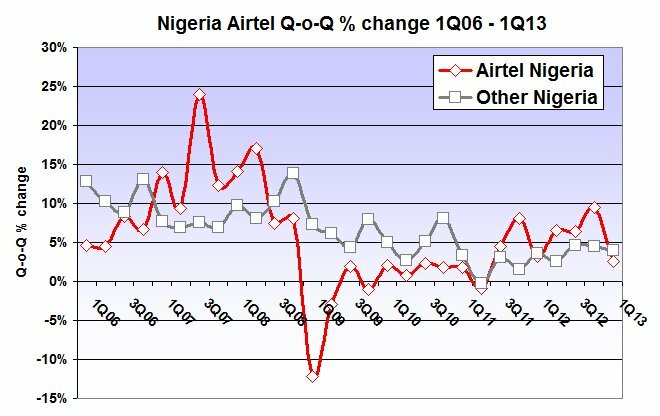 Looking at Airtel's African subscriber base, Nigeria is its biggest market, with some 21.59 million subscribers at the end of June 2013. It represents 30 percent of Airtel's African base. This is a market in which Airtel has to perform well in if it is to justify to its shareholders that it has made the right call in acquiring Zain's African assets in April 2010. But it is also a market that it cannot afford to fail in. Should Nigeria fail, the profile of its African market changes dramatically. Tanzania is its second largest market, but representing only 12 percent of the Airtel total, with some 8.6 million mobile subscribers. Airtel’s hold on Nigeria is now the subject of a serious legal challenge. Econet Wireless, with its 5 percent stake, is looking for USD 3.1 billion in damages after it opposed the sale of the Nigerian business to Airtel. 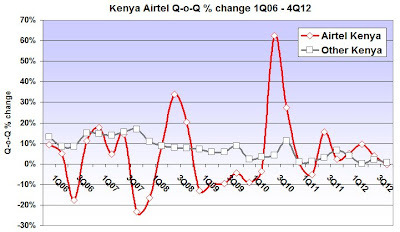 But - as in Kenya - Airtel still has to make its mark. As the African market enters a period of consolidation, there will room for up to three players in major markets, and being fourth is not a good place to be. 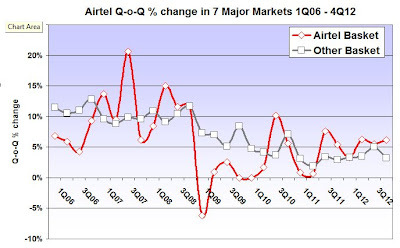 For a detailed appraisal of this key Airtel market, download a free whitepaper detailing some of the major issues now facing Airtel, and illustrated with four charts showing Airtel Africa Mobile Subscribers & Group Share by Country 2Q 2013; Nigeria GSM Operator Market Share 1Q10 - 2Q13; Nigeria Ported Mobile Subscribers end-June 2013 and Airtel Africa Mobile Subscriber Base 4Q09 - 1Q13. Its been a month of data centre developments, with Venema Advies, the Netherlands-based IT solutions company and data centre operator, saying it is building the first carrier-neutral data centre in Nigeria; which follows the news that Globacom opened a new data centre in June. "The penetration of data in African markets is still low, even in South Africa, and prices are still high. And even if everybody agrees that data will take off in a big way, it is difficult to predict when it will happen and how fast. There are of course going to be a number of challenges to overcome. How can you best prepare to quickly respond to the anticipated demand without investing too much too early? The biggest challenge is infrastructure. High quality, efficient data centres are essential. They house and power all the equipment needed for transmission of data and are both the heart and brain of any network. But traditional builds for data centres take a lot of time to plan, co-ordinate (with different suppliers) and construct. Furthermore, challenging environments add a lot of risk to a data centre project, often resulting in delays and budget over-runs. Buildings for data centres are often not purpose built to be used as technical facilities, often with water leaks and other problems, as well as being over-dimensioned since they cannot be expanded quickly and easily. The solution is pre-fabricated modular data centres. They are quicker to deploy and will in most cases save considerable time and money compared to traditional brick and mortar buildings. The facility will always be the 'right' size since its modular structure makes it easy to quickly expand in response to changing needs. More efficient power and cooling will make a pre-fabricated data centre more cost effective to run. And quality, budget and the time plan can more easily be ensured for pre-fabricated purpose built facilities, bringing predictability to the project. A pre-fabricated solution also makes it much easier to customise the data centre for specific needs and it can be deployed anywhere. Let us take a look at a live example: Vodacom in Mozambique (a subsidiary of Vodafone) recently decided to deploy a modular data centre (the eCentre) on top of a six-storey parking garage next to its corporate headquarters in central Maputo. The roof top turn-key deployment is a 126 square meter open space data centre. Vodacom needed to put the facility in place quickly, efficiently, and on time. The pre-fabricated build reduced the project risk significantly because the construction work was all done in ten weeks in a clean environment (in Sweden) and the installation work needed on site was completed in only eight days, in total a fraction of what a similar local brick and mortar project would have taken. Speed and predictability in challenging environments are critical issues in Africa considering it is the fastest growing mobile market in the world and the take off for data could be right around the corner. Pre-fabricated, modular and custom-designed data centres that can be deployed very quickly, and easily re-deployed if needed, is yet another innovative solution to an African problem (or rather African situation, since there is nothing problematic with fast growth). It is a solution that will allow data centre owners – internet service providers, hosting companies, mobile operators and banks – in Africa to act quickly and confidently towards a demand for data that might be stronger than any of us expect." David King, CEO, Flexenclosure www.flexenclosure.com. Etisalat starts to make plans for when it becomes the third largest African telco..
As the sale of Maroc Telecom to Etisalat slowly inches forward, with Vivendi finally getting round to saying it had entered into exclusive talks with Etisalat to sell its 53 percent, Etisalat has started to consider what this might mean. It has already met with analysts and shared its plans to create a French-speaking telecom cluster of about 42 million subscribers across 10 countries in West Africa. Etisalat is already present in Benin, Cote d'Ivoire, Gabon, Niger, Central African Republic and Togo with its Alantique (Moov) subsidiary. Maroc Telecom will be contributing units in Morocco (of course), Mauritania, Burkina Faso, Mali and also Gabon. The deal would see Etisalat's share of the African mobile subscription market move from 7 percent with some 50.78 million subscribers to 11 percent with around 82.7 million. Gabon - even with the combined subscriber base - will still only be the third smallest Etisalat market in Africa. Past experience suggests that the merger of networks can be a protracted affair: the UK's EE network still reflects the original T-Mobile and Orange architecture some three years after the two announced the merger. And as with the UK's EE, the combined subscriber base will ultimately lose members, as subscribers with duplicate subscriptions cancel. The Moov network in Gabon has some 410,000 subscribers, and Maroc's 820,000. AMETW is forecasting a combined total of around 1.24 million, with the smaller Moov network being absorbed by the larger Gabon Telecom operation. However, the Moroccan government, which has a blocking 30 percent stake in Maroc Telecom, still has to decide whether to allow the deal. In April 2013 Vivendi had two bids for its stake from Etisalat and Ooredoo, formerly Qatar Telecom (Qtel). In June the latter withdrew, saying the negotiations were taking too long, and it had other bids in play. It subsequently won a licence in Myanmar. Smartphone usage in Africa is not always easy to determine, particularly as there is multiple SIM ownership (subscribers have more than one subscription). Although many networks now provide 3G, and 4G is live in a small number of markets, the distribution of broadband - an essential element for the effective operation of a smartphone - is still a very long way from being universal. 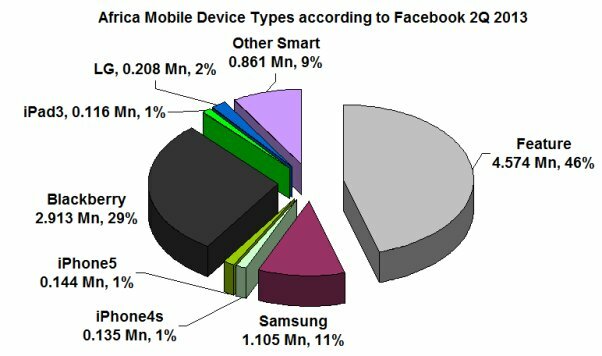 When a smartphone is acquired, it needs to be used for something, and the social networking site Facebook is generally regarded as one of the more popular Web destinations in Africa, and it provides some very useful data relating to device usage, which can be extracted country-by-country. Making allowance for multiple SIM ownership, and assuming around 491.7 million subscribers (so roughly two-thirds of all active subscriptions), then Facebook membership in Africa represents 10 percent of the active mobile subscriber base, and about 6.5 percent of the active subscription base. It follows that the Facebook membership will be atypical in that as a group, its members posses a mobile device capable of supporting access to Facebook. In this respect, smartphones are an ideal platform, although Facebook also logs access via Feature Phones. The closure last week by Standard Bank in South Africa of its WAP banking portal comes as no surprise, and it has to be said that Web access via WAP was a curiously frustrating experience. It can be expected that Facebook users represent a significant proportion of the cohort able to access the Web and therefore the Facebook data is likely to mirror the market as a whole in terms of the popular devices. It is perhaps not surprising to see Feature Phones accounting for 46 percent of all Facebook mobile users. 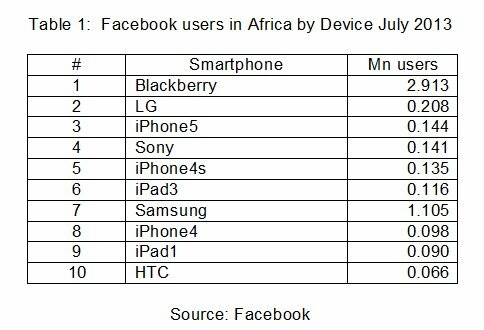 The BlackBerry has enjoyed greater popularity in Africa than elsewhere, and the Facebook data bears this out, with it being the dominant device with some 2.91 million users. LG is placed second with some 208,000 devices. Facebook is able to differentiate between the different Apple devices used for access. Sony is ranked fourth, and Samsung seventh. HTC is in tenth slot with some 98,000 devices. Given the capital-intensive nature of the business, mobile operators need a payback. And that's the balancing act all operators have to perform; investing enough to remain competitive; ensuring that the basic service levels are maintained to stay the right side of the regulator, whilst also ensuring that offerings remain sufficiently 'must have' to win and retain custom. Showing a profit also needs to be on the list. In the compelling offers stakes, in the beginning it was voice. And then it was texting (SMS). There has been a huge shift in mobile messaging, to the point that the booming rise of Over-the-Top (OTT) messaging apps (or ‘next generation’ messaging services) could herald ‘the end of SMS’. Last year Portio Research provided five-year OTT messaging forecasts which projected OTT traffic would exceed 20 trillion P2P (Peer-to-Peer) messages in 2016. The contribution messaging makes to total MNO data revenues is actually set to grow over the next few, from 65.6 percent in 2011 to 66.4 percent in 2016, as other services suffer greater marginalisation. In its ‘Mobile Messaging Futures 2012-2016’ report, Portio reckoned that SMS yielded the greatest revenue for operators in 2011 and mobile IM gathered the lowest. 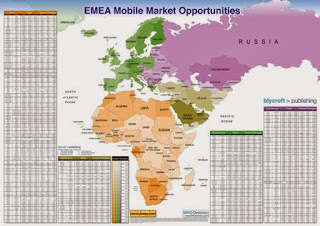 In 2012, the global mobile messaging market was worth USD 231 billion. Informa Telecoms & Media has more recently estimated that at the current rate at which OTT messaging is growing, the volume of global daily OTT-messaging traffic is set to be twice that of Peer-to-peer SMS messaging by the end of 2013. Daily OTT-messaging traffic has already overtaken daily P2P SMS traffic, according to newly collected data, with OTT messaging totalling an average of 19.1 billion messages a day in 2012, compared with an average of 17.6 billion P2P SMS messages a day. But crucially, these new generation services need broadband, and what is apparent that not all MNOs are equal in this respect. Nigeria is now Africa's biggest mobile market by subscriber numbers, and the Nigerian Communications Commission has recently noted that nearly 30 percent of the country's 114.172 million active GSM subscribers now have access to data services. However, this 30 percent is not evenly applied to all operators, and it is apparent that users have voted with their feet. Not only is MTN the largest player in the Nigerian mobile space, it is also the biggest 3G player, with some 44 percent of its mobile subscribers signed-up. Glomobile is the second largest GSM operator, but despite having its own submarine cable reaching back to Europe - which should be a major Unique Selling Proposition if there ever was one - has only signed 3 percent of its users for 3G. 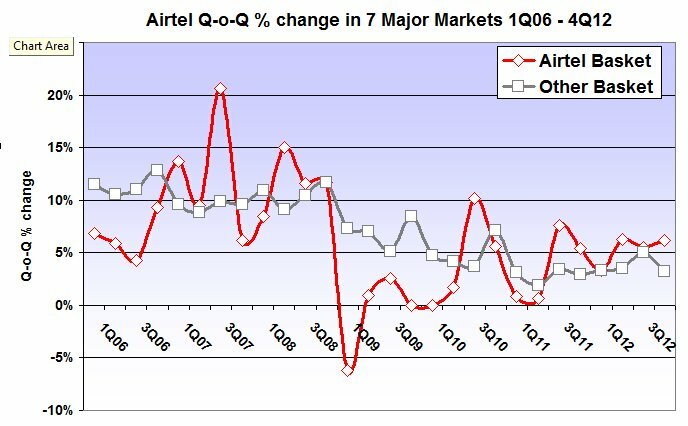 Airtel Nigeria - who acquired the Zain/Econet operation in April 2010 - is ranked second with 26 percent of its subscribers now using 3G, whilst Etisalat has smaller numbers but has persuaded a third of its subscribers to take up 3G. Despite its obvious success, the local regulator has continued to eye MTN, claiming that it is not meeting its Quality of Service KPIs, and threatening it with penalties for poor performance. At the other end of the spectrum Etisalat reckons that half the people who have ported their number since the introduction of Mobile Number Portability in Nigeria have joined its network. The conclusion has to be that MTN appears to be the network of choice for people wanting broadband access, with Etisalat probably benefiting from recent investment and ironically having a smaller customer base, so having less congestion at in-town locations during the peaks. However, perhaps the oddest thing about this data (see chart above) is not that MTN is under the cosh from the NCC, or that Etisalat is currently the biggest destination for ported numbers. Rather, it is that Glo appears to have completely failed to leverage the considerable advantage it has with its Glo-1 submarine cable, and yet the NCC, for whatever reason, has largely left it alone. May be being the local kid does have some advantages after all.